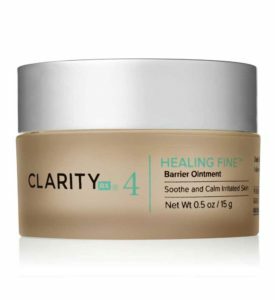 This mask is packed with skin-saving benefits that feed starved skin essential nutrients and vitamins. Amino acids, vitamins and natural oils derived from plant extracts dramatically increase your skin's moisture levels, while giving your complexion a tightened and toned appearance. 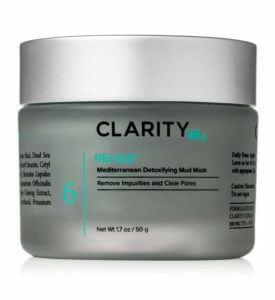 This mask is packed with skin-saving benefits that feed starved skin essential nutrients and vitamins. Amino acids, vitamins and natural oils derived from plant extracts dramatically increase your skin’s moisture levels, while giving your complexion a tightened and toned appearance. A creamy nutrient-rich mask to boost your skin’s health and appearance. ClarityRx Rise and Shine Lifting Collagen Mask is packed with skin-saving benefits that feed starved skin essential nutrients and vitamins. Amino acids, vitamins and natural oils derived from plant extracts dramatically increase your skin’s moisture levels, while giving your complexion a tightened and toned appearance. Apply a thin layer to face and neck. Leave on for 10-15 minutes. 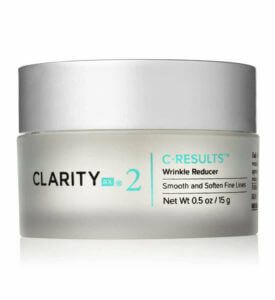 Remove with tepid water and follow with a moisturizer. Use twice a week. Aloe Vera Gel, Cetyl Alcohol, Zinc Oxide, Titanium Dioxide, Sesame Oil, Safflower Oil, Soluble Marine Collagen, Squalene, Glucose and Fructose and Sucrose and Urea and Dextrin and Alanine and Glutamic Acid and Hexyl Nicotonate (Amino Acid/Sugar Complex), Guar Gum, Tocopherol,(Vitamin E), Mango Butter, Phenoxyethanol, Hydrolyzed Silk, Sodium Hyaluronate, Palmitoyl Oligopeptide, Palmitoyl Tetrapeptide-7, Potassium Sorbate, Citric Acid. 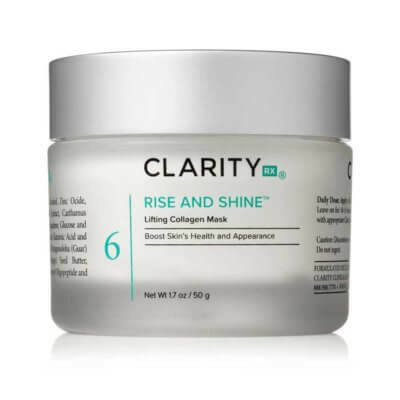 I wear it overnight and wake to soft, plump, smoother skin. I love it. I love it! Esthetician approved!